 Research Scholar-Rayalaseema University, Librarian-Sri Krishna Institute of Technology, Chikkabanavara, Bangalore, Karnataka, INDIA. Senior Librarian, Nitte Meenakshi Institute of Technology, P.B.No.6429, Yelahanka Bangalore, Karnataka, INDIA. Head, Technical Section, Deanship of Library Affairs, University of Dammam, PO Box 1982, Zip-31441, SAUDI ARABIA. Bibliometric analysis is one of the methods to measure the research output published in journals. It is very important for policy holders to know the area of research interest of faculty members as well as their selection of journals for publishing articles. It is the best tool to know the authors selection methods of journals for publishing research reports. In this paper, authors analyze the research output of engineering colleges affIliated to Vishvesvaraya Technological University in Karnataka, by using the Web of Science core collection database and prepares the list of most prolific authors, most preferred journals by the authors in different disciplines. Bibliometric measures have been used to check the performance of the scientific production in terms of articles published in peer-reviewed journals. Though a Bibliometric study has been applied to define general productivity in a given area, it may be used to evaluate the productivity of individual researchers, journals, countries, states or any other levels of performance . The basic knowledge underlying such applications is that these measures can be considered as measure of scientific quality or impact Hence, Bibliometric indicators have been applied in the context of science policy and research evaluation in a larger way. The scientific publications are real embodiments of intellectual discoveries defined explicitly which aim to transmit new ideas or information for further advancement in knowledge. Over the time, India in general and Karnataka state in particular have invested heavily in developing infrastructure for R & D activities in almost all subject areas. To measure the growth of research at individual level is very difficult, especially for the developing countries. Scientometric and other quantitative metric studies enable the science policy makers to understand and grasp the growth, development and impact of research in a field of study. Some scientometric studies conducted in the disciplines of Science & Technology in India are; Karki et al  published an article on Activity and growth of Organic Chemistry research in India during 1971-1989; Kademani et al  conducted a study on Scientometric dimensions of Nuclear Science and Technology research in India: A study based on INIS (1970-2002); Kademani et al  studied on Scientometric dimensions of Thorium research in India; Kademani wrote a paper on Scientometric mapping of Vacuum research in Nuclear Science and Technology; Gupta conducted a comparative study of India, China and South Korea Science & Technology publications output during 1998-2008; A study by Hiremath et al  reveals that the total number of publications extracted in the field of Science and Technology was 59,465 for the period 1989-2014 as reflected in the Web of Science database. A bibliometric study in Scopus on publication output in Science and Technology conducted by Bala and Gupta reveals that India produced total 48,204 papers related to Engineering which was in the fourth position and medicine was in first ranking where more number of papers published followed by Chemistry, Physics and Astronomy occupied second and third position respectively. According to the results of the study conducted by Gangan, India’s research base was completely skewed towards Physical sciences and Engineering with very little for Biological sciences and Medicine. The results of the study by Somashekara, Giddaiah, Jagadeesha in Scopus from 1989-2015 in Karnataka, reveals that University of Mysore had produced more research publications followed by Karnataka University and Bangalore University. Another study by Department of Science and Technology, Government of India, using Scopus database reveals that India’s scientific research output increased by 68% from 62,955 in 2009 to 1,06,065 in 2013 and during this period, in the research disciplines ranking Computer Science (16.7%) was in third position and Engineering (14.5%) was in sixth position. A study by Verma in Indian Science Abstract database from 2000 to 2008 reveals that Karnataka state is in the second position which produced 8,811 papers. Identify the subject areas of research papers contributed by engineering colleges. To obtain the results for the predefined objectives, Web of Science (WoS) core collection database was used to extract publications affiliated to VTU for the period 1989 to 2015 (27 years). The address of the individual College names and their locations are used as main search criteria to list the papers from all colleges affiliated to VTU in Karnataka. Care has been taken while searching as some colleges names changed after the year of their establishments. Authors’ names, category of publication, years of publications, journals’ names and research area of the papers published by each college are taken from WoS and entered in the MS Excel sheets and the desired data were tabulated. From the collected data indexed in Web of Science, it is found that, out of 191 engineering colleges, 145 (75.91%) colleges produced 3421 documents. Web of Science gives all the authors’ productivity of documents while analyzing the individual institutions’ productivity. Authors may be associated to the institution searched or to the other different institutions as collaborative authors. In this study, the coverage/search is restricted to VTU affiliated colleges, the collective result may be the most prolific author of VTU affiliated colleges or most collaborative author of VTU affiliated colleges. The data is analyzed accordingly. Table 1 indicates that there were 3240 research papers/ articles covered in Web of Science followed by 70 Proceedings. There were 46 review papers, 16 editorial materials, 15 letters to the editors, and 10 corrections were indexed. There were 9 meeting abstracts, 7 notes, 3 discussions, 3 News Items, 1 Biographical Item and 1 Book review. Table 2 indicates that during 2013-2015 maximum documents (1298) were published followed by 2010-2012, in which 921 were published. From 1989 to 2003 the average production of documents by each college in every year is near to one or below one but after 2003 it has been increased from 2.42 to 8.95 from 2004 to 2015. The chart in the Figure 1 indicates that from 1989 to 2003 there is a little growth in the paper production and after 2003; the paper production is increased in an identifiable way. From 2006 more than 100 papers were produced every year. The question raised is why only after 2006 more papers were produced and how come after 2006, there is increase in numbers of publications. This might be due to many new colleges being established after 2001 and the Library consortium (AICTE/INDEST Consortium-http://paniit.iitd.ac.in/indest/) for engineering colleges came into existence during 2002. This enables members of engineering colleges to access many online journal databases for their research activities. It played a vital role in publication of scientific papers in international journals by the faculty members. Type/category of documents indexed in WoS. The top productive colleges having PG and Research Centers of VTU indicated in the table 3. It is found that 145 Colleges produced total 3,421 documents from 1989-2015. The top 20 productive Colleges contribute 2,233 (65.33%) to the total documents (3,421). This indicates that these colleges are more engaged in research activities than other colleges and they can be treated as fast growing engineering colleges in Karnataka. The institutions having good infrastructure and research activities definitely will produce more research output. Research output of individual institution is considered as a main criterion in preparation of rank list of colleges. Four colleges MS Ramaiah Institute of Technology (MSRIT), RV College of Engineering (RVCE), Siddhaganga Institute of Technology (SIT) and National Institute of Engineering (NIE) listed in the top productive colleges of present study have got rank position 33, 35, 70, and 96 respectively in the list prepared by National Institutional Ranking Framework, Ministry of Human Resource Development, Government of India. Year wise growth of No of colleges and documents. Year wise growth of documents indexed in WoS. Top 20 productive institutions ranked in Karnataka - Papers indexed in WoS. Whether any Courses are accredited by NBA or not, since their inception? Top 20 prolific authors/collaborative authors of VTU affiliated colleges. Top 20 collaborative Institutions with VTU affiliated colleges. All the top productive colleges listed in the Table 3 are established before 2000 except five colleges namely PACE, BMSIT, RIT&M, EWE&T and EPCE&T. This clearly indicates that the old established colleges are producing more research output than the new colleges. The report of the Indian Citation Index says that any academic institution of higher education needs 12–15 years gestation period to publish more research papers in journals (http://ciihighereducation.in/pdf/ici.pdf). One important thing is that some of the branches of engineering of the top productive colleges’ are accredited by National Board of Accreditation (NBA), New Delhi. (http://www.nbaind.org/Files/AccreditedPrograms.aspx). The branches of the colleges those accredited by NBA will have more chances to receive research funds from All India Council for Technical Education (AICTE) than the non accredited colleges. Most probably, this is the main reason that accredited colleges will produce more research output than other institutions. Gangan and Gupta conducted a study by using Scopus database to identify the research output of Indian engineering and technology institutes for ten years (1999-2008) and the result of their study reveals that IITs are the top producers of research papers from India and three engineering colleges from Karnataka; RVCE, Bangalore; SJCE, Mysore; and MSRIT, Bangalore, have got 30, 40 and 57 positions respectively in the top 67 Indian engineering and technological institutes ranked. The total citations and average citations per year of top institutions are analyzed and indicated in the Table 3. MSRIT, Bangalore has got the highest number of citations, followed by SJCE, Mysore and RVCE, Bangalore whereas Average Citation per Year (ACPY) of PACE, Mangalore is the highest while MSRIT and SJCE have got second and third place respectively. In the present study MSRIT has got the first position in the top 20 prolific institutions followed by SJCE which is in the second position and RVCE occupied third position. None of the government engineering colleges have been listed in the top list of ranked institutions. This clearly indicates that in Karnataka private engineering colleges and the aided institutions are more engaged in research activities as compared to government engineering colleges. Of course, most of the government colleges are established after 2010, more time is required for them to compete with the aided and private institutions. In the top 20 productive institutions, 11 colleges are located in the silicon city Bangalore and remaining 9 colleges are located in districts’ head quarters of Karnataka state. PACE has the highest average citation per year (ACPY-103) followed by MSRIT which has 101.28 ACPY. SJCE has 84.57 ACPY and RVCE has 72.36 ACPY. In the top 20 prolific authors/ collaborative authors rank list indicated in the table 4, the authors Sharma SC and Nagabhshana H had more collaboration with the VTU affiliated colleges. The authors Nagabhushana BM, was associated in fifteen engineering colleges. This shows that high prolific authors are more engaged in collaborative research for different reasons. The main motivations for researchers to write and publish papers are for scientific communication to reach many scientific communities and to gain reputation. Peat et al  provide a list of reasons for writing up and publishing research results. There are worth reporting; wanting to progress scientific thought; wanting to reach a broad audience; improving the chance of promotion; and it is unethical to conduct a study and not report the findings. In India, recently many universities are putting condition that the papers indexed in the SCI (Science Citation Index) or Scopus will only be considered for getting scores in the selection or promotion of faculties. (http://www.ugc.ac.in/oldpdf/regulations/englishgazette.pdf). And also some universities have the conditions to award PhD degree that minimum two papers are to be published in the journals indexed in Scopus or SCI for showing their research activities in the affiliated institution. (http://www.gtu.ac.in/ PHD/2015/08102015.pdf). These are main reasons to publish papers in scientific journals. From the table 5, it is found that engineering colleges in Karnataka were more collaborative with the University of Mysore and Indian Institute of Science. Seven Karnataka state universities namely University of Mysore, Tumkur University, Mangalore University, Bangalore University, Karnataka University, Kuvempu University, and Gulbrga University were within the top 10 collaborative institutions. Three foreign institutions Universiti Sains Malaysia, National University of Singapore and Universidade De Aveiro got rank position within top 20 ranking of collaborative institutions. Some of the top collaborative Institutions in Karnataka had also collaborative research work with two IITs and two NITs. Most of the engineering colleges were conducting joint research activities with the institutions located in the state itself. Table 6 indicates the most collaborative countries engaged in research activities with VTU affiliated colleges.USA was in first position of ranking of most collaborative country followed by Malaysia and Germany which were in the second and third position. A study by Bansal et al  reveals that in Computer Science, Indian researchers were more collaborative with the United States (USA), United Kingdom and Germany. The result of the study on Mapping of Indian Engineering Research using Quantitative Indicators, 1999-2008 by Singh and Gupta gives the same result that for collaborative research, Indian researchers depended more on these countries. International Collaboration with VTU affiliated colleges. The total documents of engineering colleges were published in 898 journals. The top 20 journals preferred by engineering college researchers for articles’ publication are indicated in the Table 7. The journal 'Acta Crystallographica Section E Structure Reports Online' is being used as a top journal by authors from Karnataka region to publish their papers followed the journal 'Spectrochimica Acta Part A Molecular and Biomolecular Spectroscopy' which published 130 papers. The journal 'Journal of Alloys and Compounds' has occupied the third position in the top 20 list of most prolific journals. It is very interesting that the entire journals listed in the top list are mainly pertained to the subjects Physics, Chemistry, Polymer Science, Material Science and Mechanics. None of the journals are related to the main domain of Computer Science and Engineering, Electronics and Communication Engineering or Electrical Engineering. This shows the interest of authors’ area of research interest and shows the scope of the journals covering the subject related to engineering. The reason may be WoS does not cover more journals as compared to Scopus. WoS has several criteria while selecting journals for indexing. Most preferred publishers by authors to publish research papers are identified and presented in the Table 8. It is observed that Elsevier journals with 196 publications are most preferred by authors followed by Springer for which of 119 journals is selected by the authors for publications. Taylor and Francis is in the third position with 66 journals, followed by John Wiley with 46 journals which has got the fourth position. It is very clear from the result that authors would like to publish their papers in commercial publishers’ journals. It is quite universal that these publishers are most popular and reputed in scientific communication. The common key factors to determine the journals reputations as stated by Brorsen , Klinger , and Robey et al  are; wider circulation, lower acceptance rate with review process and the well-known editors and their affiliations. Usually, authors would like to publish the papers in peer review journals with wider database coverage. Impact factor of journals is another important criterion while selecting journals by authors. A report of the Association of Learned and Professional Society Publishers (ALPSP) research study on the motivations and concerns of contributors to learned journals says that the four criteria considered by the authors in selection of journals are; journal reputation; impact factor; international spread; and journal coverage indexed in databases. According to Babor et al  impact factor of journals is one of the important considerations in eight steps while choosing a journal. Knight and Steinbach have developed the comprehensive list of journal selection considerations and they have analyzed and organized the 39 considerations into three major categories: likelihood of timely acceptance, potential article impact and philosophical and ethical considerations. Favorite society journals of engineering college authors’ for publishing papers are American society of Civil Engineering (ASCE), American society of Mechanical Engineering (ASME), Institute of Electrical and Electronics Engineers (IEEE) and Royal Society of Chemistry (RSC). 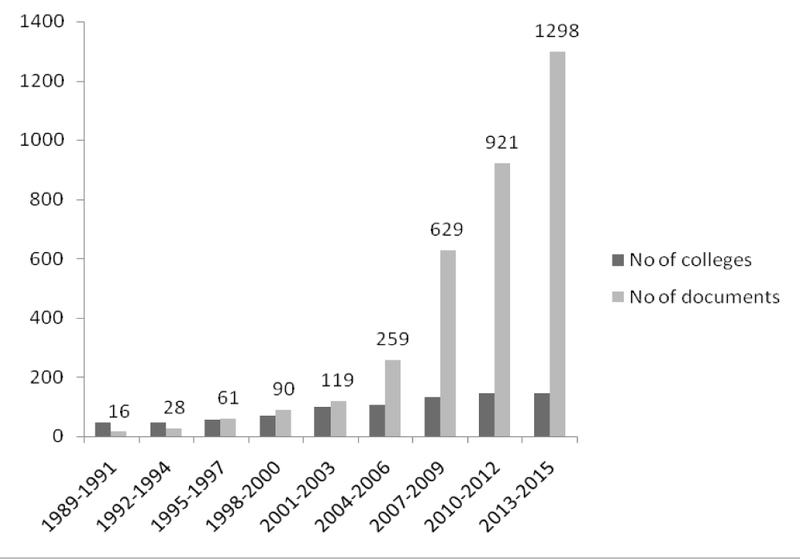 The result of the study by Raghavan and Rao reveals that a very small proportion of Indian Engineering and Technology research output get published in IEEE journals in the 10 years period from 2004-2013. Engineering colleges’ authors also choose local publications of National Institute of Science Communication and Information Resources (NISCAIR) and Indian Academy of Science (IAS) which is initiated by Union Government of India to bring out the research output. Table 9 indicates that research area 'Material Science' has maximum papers followed by Engineering. Chemistry and Physics research areas occupied the third and fourth position in the coverage of subjects. Polymer Science occupied the fifth position followed by Crystallography which is in the sixth position. Metallurgy/Metallurgical engineering area has 198 documents with the seventh position. Mechanics, Science & Technology & other Topics, Computer Science areas are having 178,157 and 154 papers and are in the 8th, 9th and 10th place respectively. The present study reveals that researchers of engineering colleges are more engaged in the field of basic sciences than engineering and technology. The findings of the study by Gupta and Dhawan reveal that Medicine, Chemistry, Physics, Agricultural & Biological Sciences were top research areas followed by Engineering. The study on Scientific Productivity of Karnataka State during 1999-2011 gives same results as Chemistry, Physics and engineering subjects were the top research areas ranked first, second and third positions respectively. It is a very remarkable feature to observe that researchers from engineering colleges have produced papers in the areas like Pharmacology Pharmacy, Biochemistry Molecular Biology, Plant Sciences and Medical research areas like Toxicology, Oncology etc. This indicates the interrelationship of engineering research area with other fields of subjects. This may have happened due to the collaborative research work of engineering colleges with other National and International institutes where multidisciplinary research activities are carried out. Indian Citation Index covers nearly 917 Indian journals and its 2015 report says that Chemistry is one of the main domains where Indian Institute of Technology-IITs have produced more papers. Chemistry has occupied third position where more papers were produced in the present study also. Most of the authors from the Engineering colleges prefer to write/publish their research output in the form of 'articles' as categorized in Web of Science. There is an exponential growth of document production with a sudden rise from 2004 onwards. It is found that all the top 20 productive institutions ranked in Karnataka are belonging to aided and private managements. Sharma SC, Nagabhushana H, Nagabhushana BM, Sarojini BK, and Narayana B are indentified as the top five prolific authors/collaborative authors of VTU affiliated colleges. University of Mysore, Indian Institute of Science, Tumkur University, Mangalore University and Bangalore University are identified as the top five collaborative Institutions with VTU affiliated colleges. USA, Malaysia, Germany, South Korea and Singapore are identified as the top five collaborative countries with VTU affiliated colleges for research activities. Acta Crystallographica Section E Structure Reports Online, Spectrochimica Acta Part A Molecular and Biomolecular Spectroscopy, Journal of Alloys and Compounds, Materials Design and Journal of Applied Polymer Science are identified as the top five journals which published the articles produced by the authors affiliated to engineering colleges of Karnataka. Elsevier, Springer, Taylor and Francis, John Wiley & Sons and SAGE publishers are recognized as the top five publishers preferred by the authors for publishing articles. The top five research areas in which the contributed papers scattered are Materials Science, Engineering, Chemistry, Physics and Polymer science. It is found that a few well established NBA accredited aided and private colleges are engaged in research and are producing more number of documents. It is suggested that if colleges would like to subscribe the high impact journals, the top 20 prolific journals preferred by the authors and the journals which are having impact factors in the Journal Citation Reports (JCR 2015) of Thomson Reuters can be considered. The engineering college libraries of Karnataka and VTU-Consortium are suggested to subscribe the resources pertained to the most prolific research areas listed in the study. The present study gives a glimpse of research output of engineering colleges. As the Web of Science does not cover all the journals in Science and Technology, more elaborative study including the databases like Scopus and Google Scholar is recommended to know the complete profile of the research output of the Engineering colleges in Karnataka. Presently in India, many Private Universities are set up and foreign universities are ready to open their units. At this juncture, in this competitive world, survival of higher/professional institutions depends on many factors like students' admission, funds and state of the art infrastructure for academic and research activities. The article publications by authors of educational institutions in journals indexed by databases like Web of Science or Scopus gives scope to get good ranking position at state/ country level or worldwide ranking. Hence, educational institutes required to provide suitable environment with good infra-structure and encouragement for Research & Development (R&D) activities of research community. Institutions are expected to encourage the authors who are involved in articulation work by giving extra incentives and perks. These factors definitely enhance the research output of individual colleges. The result of this study will be useful for policy holders of private, aided and state government engineering colleges to know the prolific area of research and lagging areas of research which can be more concentrated. This also helps in subscription of relevant journals, increasing the publication of articles in peer-reviewed journals with high impact and in taking necessary steps in increasing research activity in the campus. Andrés A , author. Measuring academic research: How to undertake a bibliometric study. Elsevier. 2009. https://doi.org/10.1533/9781780630182. Aksnes DW , author. Citation rates and perceptions of scientific contribution. Journal of the American Society for Information Science and Technology. 2006. 57(2):p. 169–85. https://doi.org/10.1002/asi.20262. Davarpanah RM, Amel F , authors. Author self-citation pattern in science. Library Review. 2009. 58(4):p. 301–9. https://doi.org/10.1108/00242530910952846. Sharma RM , author. Research publication trend among scientists of Central Potato Research Institute: A bibliometric study (2009). Karki M, Garg K, Sharma P , authors. Activity and growth of organic chemistry research in India during 1971–1989. Scientometrics. 2000. 49(2):p. 279–88. https://doi.org/10.1023/A:1010521203335. Kademani BS, Sagar A, Kumar A, Kumar V , authors. Scientometric mapping of vacuum research in nuclear science & technology: a global perspective. In Journal of Physics: Conference Series 2008 (Vol. 114, No. 1, p. 012054). IOP Publishing. https://doi.org/10.1088/1742-6596/114/1/012054. Gupta BM , author. A comparative study of India, China and South Korea S&T publications output during 1999-2008. Hiremath Rudramuni, Gourikeremath Gouri N, Hadagali Gururaj S, et al. , authors. (2016)“India’s Science and Technology output, 1989-2014: A Scientometric Analysis” (2016). Library Philosophy and Practice (e-journal).Paper 1367. http://digitalcommons.unl.edu/libphilprac/1367. Bala A, Gupta BM , authors. S&T Contribution of Chandigarh during 1998–2007: A Case Study. Collnet Journal of Scientometrics and Information Management. 2009. 3(2):p. 29–43. https://doi.org/10.1080/09737766.2009.10700874. Verma K , author. Bibliometric study of Indian S&T publications as reflected in Indian Science Abstracts, Collnet Journal of Scientometrics and Information Management. 2009. 3(2):p. 19–28. https://doi.org/10.1080/09737766.2009.10700873. Peat J, Elliott E, Baur L, Keena V , authors. Scientific Writing: Easy When You Know How. BMJ Books; London: https://doi.org/10.1002/9781118708019. Singh Y, Gupta BM , authors. Mapping of Indian Engineering Research using Quantitative Indicators, 1999–2008. Collnet Journal of Scientometrics and Information Management. 2010. 4(2):p. 1–12. https://doi.org/10.1080/09737766.2010.10700888. Brorsen BW , author. Observations on the journal publication process. In: North Central Journal of Agricultural Economics. 1987. 9(2):p. 315–21. https://doi.org/10.2307/1349400. Klinger JK, Scanlon D, Pressley M , authors. How to publish in scholarly journals. Educational Researcher. 2005. 34(8):p. 14–20. https://doi.org/10.3102/0013189X034008014. Swan A, Brown S , authors. ‘What authors want’. Learned Publishing. 1999. 12:p. 74DOI: 10.1087/09531519950145878. https://doi.org/10.1087/09531519950145878.